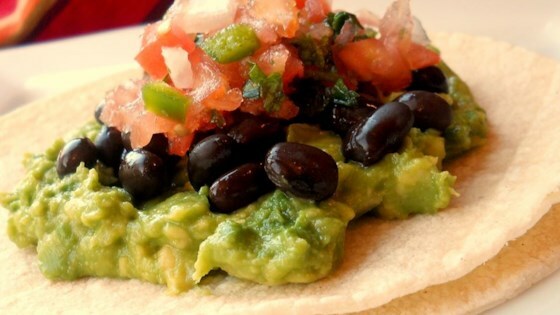 "Guacamole, beans, and homemade salsa combine to make a light, flavorful alternative to traditional tacos." Combine the canned tomatoes, fresh tomatoes, 1/2 of the onion, garlic, cilantro, and jalapeno in a food processor. Chop roughly; do not puree. Combine the pulp of the avocados and the remaining onion in a large bowl. Mash until almost smooth. Season with salt and pepper. Spread tortillas in a single layer on baking sheet. Place in oven until warm, about 5 minutes. Spread tortillas with guacamole. Top with beans, salsa, and lettuce. Substitute black beans for the kidney beans, if you prefer. This is almost exactly how I have made tacos before. I love guacamole(some of us do live in areas where decent avocados are available year round).